I have the privilege of being able to hear from and visit with many of you each week. As a group, you are highly informed about current events and are fully aware of the offenses committed against our liberties by the Obama administration. 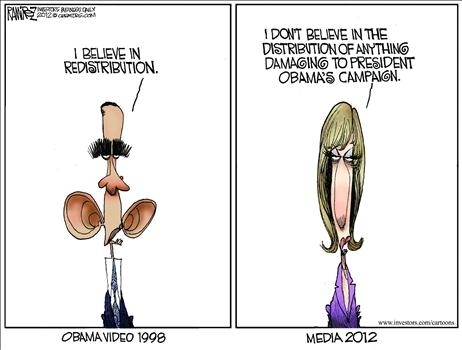 You see the profound bias on display in the old media and you recognize that the old media is doing all they can to tip the playing field in Obama’s favor. And you are concerned about the polls. Andrew Brietbart would remind us right now that WE are the new media. What’s on TV is intentionally constructed to distort the narrative about what is really happening in order to discourage us. Recognize it for what it is. This is not a time to sit around worrying and wringing your hands. Every one of you is needed in this fight for the soul and direction of our country. Set aside any lamenting about where we are; we are here and there is much to be done. What can YOU do between now and Election Day? Pray. In America, it’s In God We Trust. Our rights come from God and recognizing the role that God has played and must play more visibly in our personal and civic lives is central to our success as a nation. Take a moment throughout your day to stay connected to the God who makes our liberties possible. Make sure that you are registered to vote. Also make sure that others who will vote their values are registered also. The last day to register for the November election is October 9th. You can check your voter registration status at www.VoteTexas.gov. Other election resources are available at www.TexasPatriotsPAC.com. Reach out to voters in swing states in particular: Ohio, Florida, Colorado, Iowa, Wisconsin, New Mexico, Michigan, Nevada, New Hampshire, Virginia. Pick up the phone or email people you know there – in-laws, nieces and nephews, old classmates, neighbors who have moved, old businesses acquaintances. Give your ex-wife who lives in Michigan a call; she may be an undecided voter and maybe she’ll be glad to hear from you. That genuine contact from you to someone you know is so powerful, and will make the difference for our side. Andrew Breitbart was right: WE are the new media. Get or start using your Facebook page to comment on what you see around you, especially what you experience that counters the narrative continually pushed by the sold-out media. Get a Twitter account and Tweet something regularly. If you don’t want to write something yourself, retweet someone else’s post. Get involved in a phone bank making contact with likely voters in swing states. We will be participating in a phone bank focused on identifying likely voters in New Mexico and we would welcome your participation; we will have more details soon. Also, you can make calls from home for Romney/Ryan here. Encourage your pastor to get involved in Pulpit Freedom Sunday, October 6th. The future of religious freedom depends on a free pulpit to communicate fundamental, biblical principles to congregations across America. Texas Patriots PAC has been so privileged to work with a number of area pastors who recognize this responsibility and have offered non-partisan voter registration drives to encourage voting in their congregations. These pastors are leading in an area critical to our survival as a nation and we applaud their efforts. Do not allow the anxiety and concern you feel about the significance of this election to deter you from taking action. Taking action is the best antidote to anxiety. You, good Patriot, can make the difference in this election, and you may not ever know it. Choose something on this list and act so that on November 7th, you can say that you did all that you could to defeat Obama. Remember that this is a marathon, not a sprint. When Romney wins this election, we cannot rest, relieved to have dodged the bullet of Obama’s 2nd term. We are in this situation because the other side has been working for decades to control our education system, to systematically remove God from our civic presence, and to constantly nudge our public servants toward expansive government, with no counteracting response from us. Recognize and commit yourself to maintaining yourself as a more vigilant and active citizen. Please forward this message to other Patriots who are motivated and seek direction.Each of us has a role to play in this election and together, we are unstoppable.Meeting and hearing from you fills me with hope and gratitude for you good Patriots who are getting active on behalf of our shared values.Many of you have not been active politically before but you see the need now.This trend that we see means that many more of you may be likely voters than the polls indicate.Choose something off this list of actions each day, and be encouraged that many more than you know are doing the same thing. Thank you for getting active! May God continue to bless America.